Acquired: TTM 2010, C/o work. 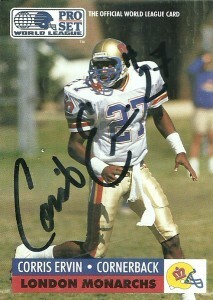 Corris Ervin would be an outstanding defensive back for the Central Florida Knights- being so good as to be drafted by the Denver Broncos with their 5th round pick in the 1988 draft. Ervin would spend time on the San Fransisco 49ers developmental squad in 1989 and would walk by me a few times in Dallas Cowboys Training camp in 1990. 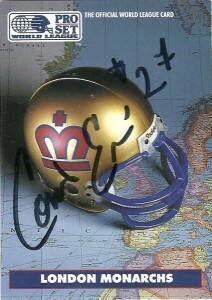 In 1991, the London Monarchs would draft Corris first in the WLAF positional draft for the defensive secondary. He’d form a cornerstone of the Monarchs #1 defense and secondary, helping the team win the World Bowl in 1991. After winning All-World League honors, he’d return to the states after the 1991 season, but in 1995 decided to take another shot- this time with the NFLE playing for the Scottish Claymores. 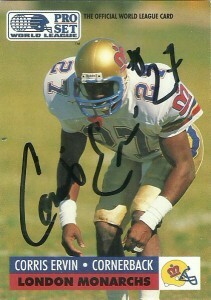 Corris would make another 2 interceptions playing for the team and return back to the United States to play in the CFL for the Baltimore Stallions and in Canada with the Blue Bombers. In 1996 Ervin would go to the Arena Football league playing for both the Tampa Bay Storm and the Orlando Predators that year. He’d hang onto the roster of the Predators through 1999 where he was then traded to the Florida Bobcats, retiring after the season. Corris would also make an appearance as a defensive back in the movie “The Waterboy”. I started trying to track down players through social network sites and quickly found Corris after I was able to acquire teammate Howard Feggins. He kindly signed 3 cards for me and currently runs his own cabinetry business out of the Orlando area. Below are his statistics from the London Monarchs in 1991.